As one of the world&apos;s great ancient capitals, and the capital of the world&apos;s upcoming second superpower, Beijing is the most important and interesting city in China, both in relation to tourism and to understanding China. For more than 800 years, Beijing served as the capital of six ancient dynasties, the most famous being the Ming (1368–1644) and Qing (1644–1912) dynasties. It is home to the greatest collection of sites from China&apos;s imperial past, including the Great Wall, the Forbidden City, the Temple of Heaven, and the Summer Palace. Though it&apos;s not such a big tourist draw, Beijing&apos;s modernity is also interesting. If you have no time to go to Shanghai, Beijing offers you a chance to appreciate modern China — with its hi-tech infrastructure and super-modern buildings, like the “Bird&apos;s Nest” National Stadium and the Water Cube. There is also a palpable prestige in Beijing, fitting for the capital of this proud and powerful nation. Sample it at Tian&apos;anmen Square during flag ceremonies at dawn and dusk, and at the Mausoleum of Chairman Mao. A Beijing opera actor on the Great Wall: China&apos;s culture and architectural feats are top reasons to visit. Beijing is one of China&apos;s foremost cultural hubs, with its own renowned duck dish, its opera, housing styles, dialect, etc. The world-famous Peking roast duck is a must-taste food in Beijing. With a history of more than 600 years, it is China&apos;s most famous imperial dishand has become symbolic of traditional Chinese food. 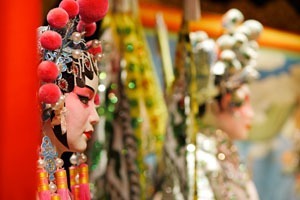 Beijing opera, one of the classic art forms of imperial China, is regarded as one of China&apos;s cultural treasures. The ancient alleys, the hutongs, are the last bastions of traditional courtyard houses in Beijing. The best way to travel around the hutongs is by taking a rickshaw. 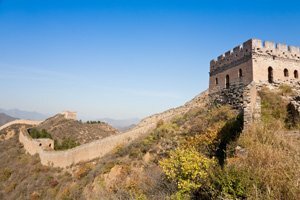 Walk the Great Wall: On Trip Advisor in 2018, the top #1 and #3 things to do in Beijing are visiting the Mutianyu and Badaling sections of the Great Wall, respectively. 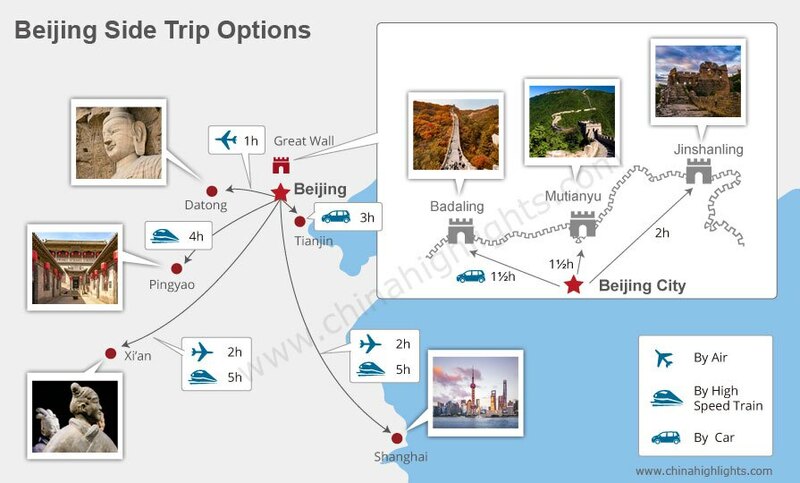 Find the suitable Great Wall itinerary on our Great Wall tours page. Savor the Summer Palace — where one palace was forbidding, this one is inviting! Wander around where royals relaxed in the warmer months. Hutong discovery. Sightsee, shop, and savor delicate snacks in ancient residential and shopping streets. Dine on duck, Peking style, and other tasty Beijing cuisine. Lose yourself in the historic narrow hutong alleyways. Many old Beijing residents still live in the hutongs, soaked as they are in history and packed with numerous delicate shops and cafes. Hutong exploration may be one of the most interesting experiences for visitors to Beijing. 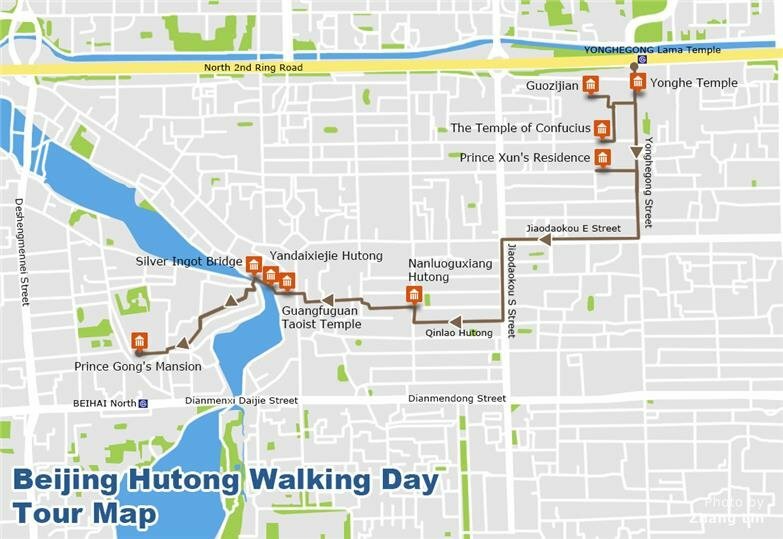 Learn more about the best hutong tours, the Top 10 Hutongs in Beijing and the Top Things to do in Hutongs. Beijing is spoiled by such a wide variety of nightlife choices. Housing an estimated population of 107,000 expats (2018), the city is never short of western-style cafés, bars and clubs. Plus, Beijing is the engine of China&apos;s underground rock music. Bar street and club area to visit: Houhai bar street is like a hub for local youth culture. The Sanlitun night club area is packed with stylish night clubs for night owls and is where expats often hang out. 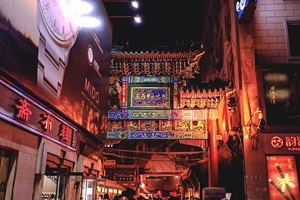 Savor Beijing snacks, do a hutong night-food gourmet walking tour. Enjoy breathtaking night views on the Great Wall at the Simatai section of Great Wall. Enjoy Beijing Opera or a Kung Fu Show in reputable traditional tea houses. Admire nighttime cityscapes: Option A Olympic Green Park area: the Bird&apos;s Nest and Water Cube light up at night; Option B The CBD area: quite a few landmark buildings like the CCTV headquarters, The Place, Guomao and the newly erected CITIC Tower combine to create Beijing&apos;s night skyline. Learn more about Things to Do at Night in Beijing. In Beijing, there is a limitless range of international cuisine to choose from, in every price range. It is easy to find Chinese restaurants, Western restaurants, vegetarian restaurants, Muslim restaurants, and Asian restaurants. One of the most famous specialties of Beijing is the Peking roast duck. Check the top 10 Beijing foods you must try. Beijing can be a shopaholic&apos;s heaven. World famous international-brand shopfronts are packed along Wangfujing Street, which doubles up at night as an exotic snack street. Apart from that, Beijing is home to Qianmen Street and Dashilar Street, two classic commercial streets that have prospered for centuries. Beijing also hosts bizarre antique markets, amazing to tourists. Beijing is an international city with a vast range of accommodation suiting every budget from luxury hotels to guesthouses. If you want to experience old Beijing life, you can opt to stay in a traditional hutong courtyard. Learn more about the 11 Best Neighborhoods to Stay in Beijing. Beijing is approximately at the same latitude as Philadelphia in the U.S. (but drier in winter and wetter in summer) and Madrid in Spain (though colder in winter). See Beijing Weather. Although you could travel Beijing throughout the year, autumn (September and October) is the most highly recommended season to visit for the relatively comfortable temperatures and the scenic beauty.Below is the weather chart for Beijing for your referance. Beijing&apos;s air quality is improving, with better public transport, restrictions on the use of vehicles, and the relocation of factories. Breathing Beijing&apos;s air for six average days is the equivalent of smoking just one cigarette, which is not bad for a large developing world city. See What to Do on a Low Air Quality Day in Beijing. Beijing is China&apos;s No. 1 gateway city and it has China&apos;s biggest airport (the world&apos;s second busiest), Beijing Capital International Airport. The airport serves around 120 destinations. There are many flight choices for visitors from all continents. It is likely to be your best choice for entering or leaving China. From Beijing, it is easy to travel by plane or direct bullet train to most major destinations in China, such as Xi&apos;an or Shanghai. See more on Beijing Transport and learn about how to get to Beijing city from Beijing Airport and how to get to the Great Wall. As a capital city, Beijing has traffic problems like anywhere else in the world, especially during rush hours or national holidays. 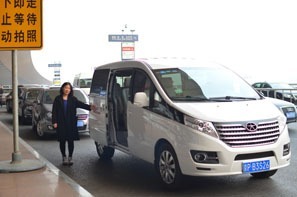 Contact us for a private tour with a private vehicle driven by an experienced local driver and a knowledgeable English guide is the best hassle-free option to avoid traffic congestion and help you maximize your time. Beijing&apos;s subway system is the second largest in China, and the cheapest way to get around in Beijing. During rush hour, however, some popular lines can be very crowded. 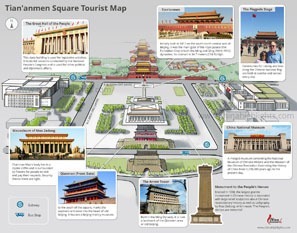 Our Beijing map page provides tourists with many useful maps, including a map of the layouts of Tian&apos;anmen Square, the Forbidden City, Beijing Zoo, Beijing city, and the Beijing subway system. These are all high-resolution and you are more than welcome to download for free! The relatively new 144-hour visa-free transit policy makes Beijing a more convenient travel destination.Tourists who qualify under the policy can visit Beijing for 6 days without a visa. Learn more by reading the 10 Things You Should Know About Beijing Layovers and How to Spend Your Beijing Layover(Things to Do & Ideas). 6 Days Beijing and Xi&apos;an Tour, home of the Terracotta Warriors, a city full of history. 6 Days Beijing and Shanghai Tour,a trip to see China&apos;s future. 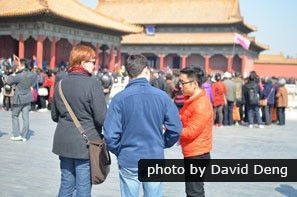 Check details of all the options of Best Beijing Side Trips and Top China Tours from Beijing. Beijing and Shanghai are both super cities, each worthy of a visit, possessing unique charm and beauty. Beijing is the place where for centuries, emperors were based. It is the historical and cultural capital of China. It may suit the first-time visitor to China, for it shows an authentic China. 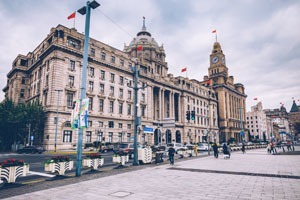 Shanghai has experienced nearly 100 years of colonial history and is now serving as China&apos;s economic engine, during the country&apos;s rise to power. Learn about Beijing Vs Shanghai: which one is better to visit. 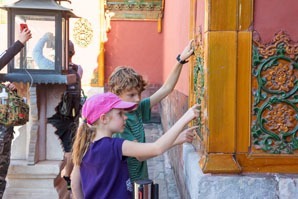 Our Beijing guide relates the history of the Forbidden City, whilst avoiding the crowds. Beijing is such a large and complex city that going with a tour guide and driver helps make your visit less stressful and more rewarding. Experience and customer feedback show that our well-designed tour plans cover the highlights of Beijing in the best possible ways. Just make a free inquiry for a customized tour with professional arrangements, to save you time and avoid any unforeseen problems. We have over 20 years of experience tailoring tours in China! 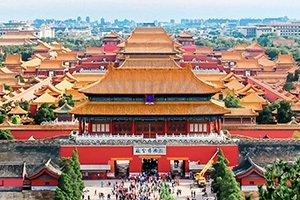 1-Day Beijing Highlights Tour — Visit the Forbidden City and the Great Wall at a your own pace. 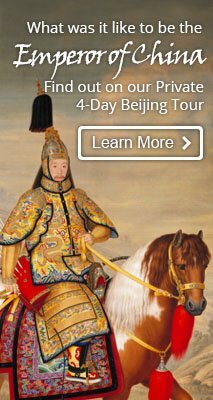 4-Day Emperor&apos;s Tour of Beijing — This 4-day tour is designed to be flexible, without missing the must-sees. The Golden Triangle — This 8-day Beijing–Xi&apos;an–Shanghai itinerary,or variations of it, has been our most popular first-time China trip over the last 20 years. Check all our Beijing Tours for inspirations.